Rugunda recieves a book from Insight Survey Limited employees. Photo by Raymond Mayanja. To avoid errors committed during the 2016 general elections by different players the NRM government has been urged to implement the recommendations made by local and international election observers. To simplify government work all the observer reports were compiled into a book titled: ‘Uganda Election Souvenir Handbook’. The book also gives highlights of the political history of Uganda. In the book, the European Union, one of the election observers, urged government to establish an independent and transparency Electoral Commission before the next general elections in 2021. “The 2016 general elections fell short of international standards for the conduct of democratic elections at key stages,” the observers noted. While meeting the Prime Minister, Dr Ruhakana Rugunda, at his office, the commercial director Insight Survey Limited, Hajj Edirisa Sekitoleko and his team, the publishers of the report, said Uganda previously lacked a platform to analyse observers’ reports after general elections. “We are hopeful this book will help stakeholders avoid committing the errors committed during last year’s general elections,” Ssekitoleko explained. He also told the Premier that they want the book to serve as a point of reference for students and legislators. 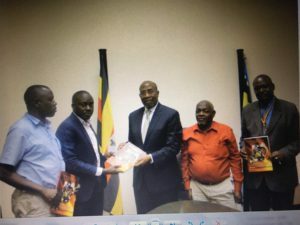 In response, Dr Rugunda said that the book will be launched by Vice President Edward Ssekandi, a week before this year’s Independence Day celebrations slated for October. The National Consultative Forum for Political Parties and Organisations also participated in compiling the book. Dr Rugunda, the chairperson of the Forum, said during last year’s general elections, complaints were received from all stakeholders and forwarded to the Electoral Commission and the Attorney General for redress. He said that participation by Ugandans was impressive, adding that citizens turned up in big numbers. “The increased participation made last year’s general election one of the most highly contested in recent times,” Dr Rugunda said. In last year’s presidential elections, President Museveni defeated his rivals Dr Kiiza Besigye of Forum for Democratic Change, the former Prime Minister Amama Mbabazi, who stood as independent candidate, and the former Makerere University Vice Chancellor Venansius Baryamureeba. Others in the race were retired Army General Benon Biraaro, Joseph Mabirizi and former presidential advisor Faith Kyalya. Museveni’s rivals claimed there was massive rigging of the vote. Mbabazi dragged Museveni and Electoral Commission to court but he lost the case. Dr Besigye was locked away at his Kasangati home in ‘preventive detention from polling day for more than a month, effectively making it impossible for him to petition court. He was arrested in the upscale Naguru area just outside a property where he said the ruling party had set up its vote rigging machinery.